Mercedes has taken a 75 percent majority stake in Brawn GP, the Formula One team that became 2009 world champion in the Formula One constructors championship and provided the new champion and number three in the drivers championship, Jenson Button and Rubens Barrichello. The name Brawn GP will disappear and transform into Mercedes Grand Prix. The team wants to make an all out German Formula One team and most likely German Formula One drivers Nico Rosberg (ex-Williams) and Robert Kubica’s former teammate at BMW Sauber, Nick Heidfeld, will make up the 2010 line up. Mercedes all German, McLaren all English? The move did not come completely unexpectedly. Rubens Barrichello already made a transfer to Williams and a driver’s swap with Nico Rosberg to Brawn GP was already very feasible. Also, the fact that Brawn GP itself could not afford the salary of now world champion Jenson Button fuelled the rumours of intervention of some sort by Mercedes, now being the only constructor with a self-named team next to Ferrari to be certain of a place on the 2010 grid. It is still unclear if Robert Kubica will appear at the start of next season with Renault, but if he does his teammate will not be Kimi Räikkönen. The 2007 world champion has been bought out by Ferrari, to make way for two time world champion Fernando Alonso, but has not yet found a team. To him, the move by Mercedes and Jenson Button would come as a surprise because he had publicly stated that he was talking and expecting to join McLaren in the near future. Although not confirmed, Räikkönen has now set his sights set on the remaining seat at Renault, though due to lack of financial resources and the desire to have a “home driver” of French nationality, Romain Grosjean and Franck Montagny remain with fair chances for a 2010 seat. Because of a large amount of Dutch sponsors, the team is also rumoured to contract Indy Car racer Robert Doornbos from The Netherlands, or Dutch talent Guido van der Garde, who took the title in Formula Renault some years ago. Williams have confirmed Rubens Barrichello and Nico Hülkenberg, while Red Bull Racing will keep their current driver line-up: Sebastian Vettel and Mark Webber. Campos Meta, one of the new F1 contenders, have already confirmed Bruno Senna. They also have stated to have seized talks with Pedro de la Rosa and are now discussing a deal with Russian talent Vitali Petrov, or the Venezuelan driver Pastor Maldonado; both drivers are supported with big national sponsorships, something that the financially limited team from Spain desperately would be in need of. The new Malaysian team Lotus are most likely to take on Jarno Trulli and possibly Kobui Kobayashi, though Malaysian top driver Alex Yoong, already with some F1 experience under his belt, is also being mentioned. USF1 are the first of the new competing teams to have submitted their entrance fee and are therefore definitely confirmed for Formula One racing in 2010, while the team is likely to have American drivers only in their cars: most heard names are ex-Formula one driver Scott Speed, the only female racing driver in the top of car racing, Dana Patrick, or NASCAR sensation Kyle Busch. 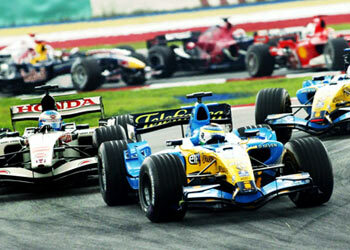 Canadian driver and 1997 F1 world champion Jacques Villeneuve is being mentioned for both Lotus and USF1. Qadbak Sauber have got a guarantee that if they enter Formula One as the 13th team, and will be supplied with engines by Ferrari. The deal with Ferrari might mean a possible racing role for Ferrari 2010 test driver Giancarlo Fisichella, who has expressed his desire to combine his test role with a racing seat. Also, Malaysian petrol giant Petronas has decided to stay linked to the Swiss Sauber team, which is remarkable since the sport now has a Malaysian constructor with Team Lotus F1. This might indicate that Alex Yoong, who is sponsored by Petronas, would not move to Lotus but to Qadbak Sauber. Finally, Manor GP are struggling: the team joined expecting the new budgeting caps to be implemented, but since that never happened in an attempt to keep the current teams on board, the team is searching for more financial strength despite having a deal with Richard Benson’s multinational Virgin, currently sponsor to Brawn GP. The team is rumoured to have spoken to the company owned by Nelson Piquet Sr., which sparkles gossip of a possible return of “crashgate” driver Nelson Piquet Jr. They’ve already signed German driver Timo Glock. Romain Grosjean (Fra) ? / Robert Doornbos (Ned) ? / Guido van der Garde (Ned) ? Scott Speed (Usa) ? / Dana Patrick (Usa) ? / Kyle Busch (Usa) ? Bruno Senna (Bra), Vitali Petrov (Rus) ? / Pastor Maldonado (Vnz) ? Jarno Trulli (Ita)*, Kobui Kobayashi (Jpn) ? / Alex Yoong (Mal) ? / Jacques Villeneuve (Can) ?